Maurizio Sarri is surely a man on borrowed time after Chelsea’s humiliating 6-0 defeat to Manchester City in the Premier League on Sunday. 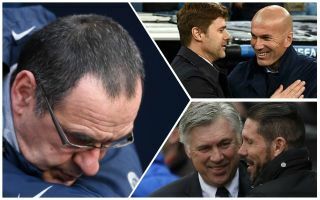 Roman Abramovich is not known for being a patient man, and previous Blues managers have been sacked for less than this, with the loss at the Etihad Stadium representing the club’s biggest in the Premier League era. The Telegraph claim Sarri has around two weeks to save himself at Chelsea, with the Europa League likely to be crucial to his chances of staying on at Stamford Bridge. Still, if we are nearing the end of the Italian tactician’s short reign in west London, who could be an ideal replacement for him? We’ve picked out seven top candidates who could come in and sort things out before then also inevitably being sacked after a dip in form after, who knows, a year? And then the whole wretched cycle can start again. For now, what do we think of these options, Chelsea fans? If Jose Mourinho can have two stabs at the Chelsea job, surely Carlo Ancelotti deserves another go by now? The Napoli manager has done a decent job after inheriting Sarri’s job in Naples, and tends to win big trophies pretty much everywhere he goes. In his remarkable career, Ancelotti has three Champions League titles under his belt, plus league titles in Italy, France, Germany, oh, and England of course. Ancelotti was sacked by Chelsea just a year after winning the double, which was probably a tad premature, so CFC fans would surely welcome him back to sort things out now? A man who’s going to be linked with a whole host of big jobs after his immense success at Real Madrid, perhaps Zinedine Zidane could be the man for Chelsea. The French tactician won three Champions League finals in a row in less than three full seasons at the Bernabeu, and also picked up a La Liga title in that time. One of the greatest players of all time is now looking like fast becoming a leading coach as well, even if some doubts remain about whether he could replicate his Real Madrid success elsewhere. Admittedly, this Chelsea team looks like a far bigger challenge after a pretty dire couple of seasons, and with doubts over the future of Eden Hazard. Then again, could a move to hire Zidane be precisely what’s needed to help the London giants keep the Belgian? “Everyone knows the respect I have for Zidane as a player, but also as a manager. He was my idol,” Hazard told HLN, as quoted by the Telegraph in 2017. At the time that looked a worrying statement amid links with Real Madrid, but with Zidane stepping down last summer, this could be a huge opportunity for Chelsea to kill two birds with one stone.